6.04 million citizens are internally displaced in Colombia — the second highest number in the world — according to a report published Wednesday. Colombia is only surpassed by Syria, with 7.6 million people affected by the issue, stated the information compiled by the Internal Displacement Monitoring Center (IDMC). The figures result from six decades of research on the matter. In 2014, 137,000 people were displaced in Colombia, which is less than the records held for the previous year, according to the IDMC. The more than 50-year-long armed conflict on Colombian territory and the resultant spread of violent crime are the main factors that lead people to leave their homes, the statement said. Displacement statistics in the departments of Choco, Valle, Cauca and Nariño collectively made up half of the total national displacement occurred in 2014. Colombia’s border with Venezuela is another highly affected area. The Pacific coast of Colombia — traditionally amongst the regions most hit by the Colombian conflict — is home to illegal groups of demobilized paramilitaries who intimidate civilians to the point that they abandon their homes, according to the IDMC. However, guerrillas from both the FARC and the ELN are responsible for “the largest proportion of the new displacements that occurred during 2014,” said Wednesday’s report. Would a peace deal solve the problem? The IDMC emphasized that a peace deal between the government and the FARC could help to reduce the problem. The Colombian government and rebel group FARC have been negotiating a peace agreement since November 2012, to put an end to the more than 50-year-long conflict that has killed more than 7 million. So far, the two warring parties have reached partial agreements on rural reform, the FARC’s move from war to politics, and the rebels’ abandoning of drug trafficking, one of the guerrillas’ main sources of income to fund their war. However, no agreement has been reached on the final end to the conflict, which includes the issue of attending to the millions of displaced citizens. The institution warned that without an appropriate strategy to improve “local capacities in the search for durable solutions, a better humanitarian assistance and the strengthening of the independence of the international organizations as monitoring bodies,” the problem of displacement could continue, even with a peace deal. 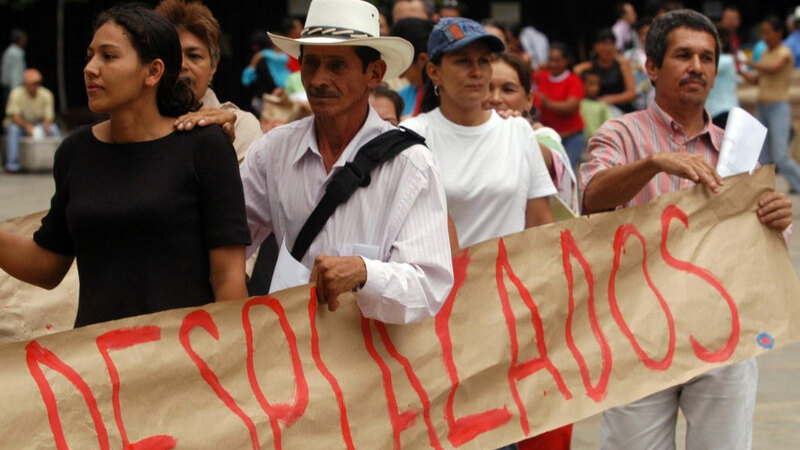 Attached to the problem of internal displacement is the concept of land restitution – one of the flagship slogans accompanying the Havana peace process. So far, the results in that respect have been underwhelming. Amnesty International explored how the Victims and Land Restitution Law of 2012 is failing the vast majority of people whose lands have been stolen, in a report from 2014. Most victims are unable to return home as a result of ongoing threats of violence and the slowness of the process in place. “Colombia has one of the highest levels of forced displacement in the world and it is patently clear that the authorities are not doing enough to ensure that stolen lands are effectively returned to their rightful occupants,” said Colombia researcher from Amnesty International (AI) Marcelo Pollack. “Handing over a land title and sending people on their way is not enough,” Pollock said last year. A victims’ registry created as part of the Victims and Land Restitution Law faces a backlog waiting of requests to be evaluated. The law “has been hampered by a lack of financial resources and delays in the appointment of essential staff,” said the IDMC. 11 million people were displaced globally in 2014, according to the IDMC report. This equates to 30,000 people a day. “These are the worst forced displacement figures in a generation, which underlines our utter failure to protect innocent civilians,” said Secretary General of the Norwegian Refugee Council Jan Egeland. “This report should serve as a tremendous alarm. We must break this trend where men, women and children are trapped in areas of conflict around the world,” Egeland said in a statement of the IDMC.